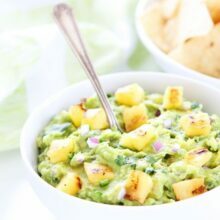 Grilled Pineapple Guacamole-creamy guacamole with sweet, smoky grilled pineapple chunks! 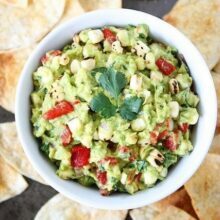 This is the ultimate summer guacamole recipe! Guacamole is my life. I love good, classic guacamole, but I also love jazzing it up. You may have noticed if you saw my Great Guacamole Guide. 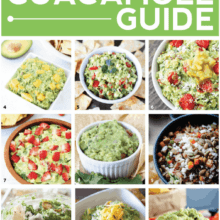 The guide includes 15 of the BEST guacamole recipes you will ever eat. No joke. Well, I have one more guacamole recipe to add to my guide. 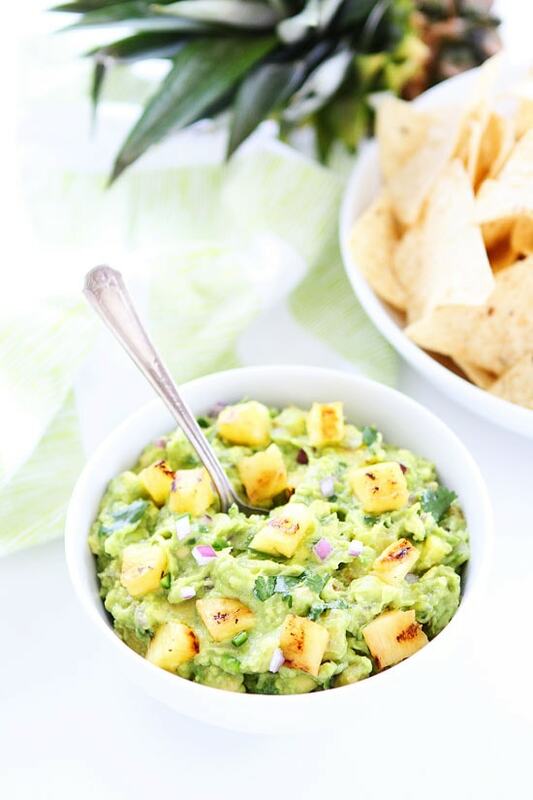 This Grilled Pineapple Guacamole is SO good and a must make for summertime! I used to be allergic to pineapple, but pregnancy cured me! Yay! My allergic reaction to pineapple went away when I was pregnant with both boys and luckily it hasn’t come back. I have been enjoying fresh pineapple on a regular basis. I can’t get enough. The other day Josh was grilling up some pineapple to go with our dinner and I was making guacamole. When he brought the grilled pineapple in, I stole it, chopped it up, and added it to my guacamole. I thought he might be mad that I stole his precious grilled pineapple, but he grabbed a chip and started dipping. He loved my guacamole creation! The grilled pineapple makes the guacamole extra special. It is juicy, sweet, and slightly smoky. It is so good mixed into the guac! 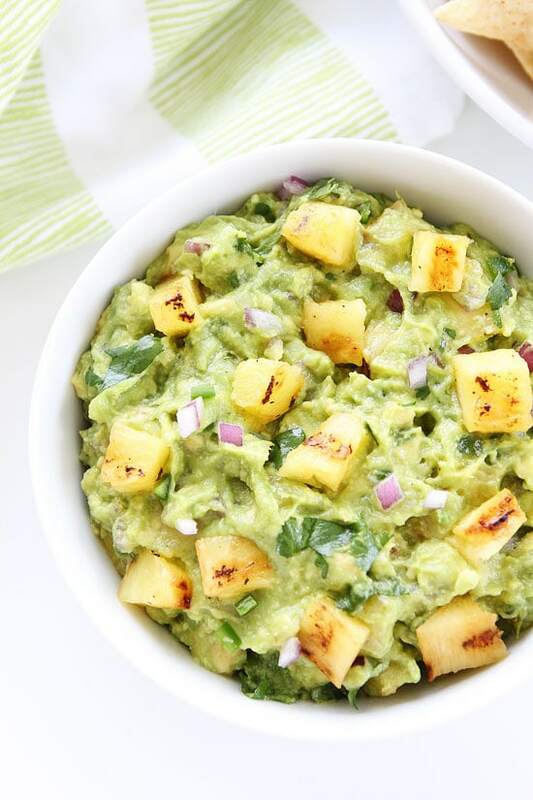 Grilled Pineapple Guacamole is the ultimate summer guacamole. You have to try it! Make it for all of your summer parties! It is guaranteed to be a hit! 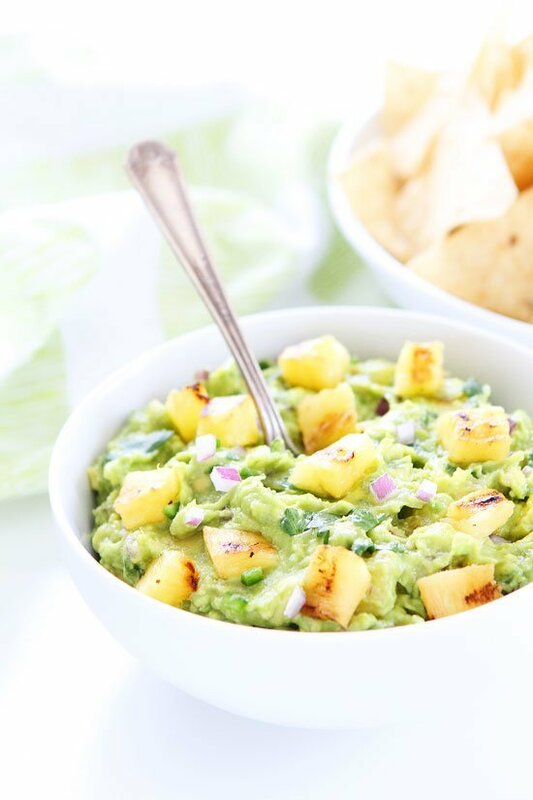 Creamy guacamole with sweet, smoky grilled pineapple chunks! Make this guacamole for all of your summer parties. It is sure to be a hit! 2. Brush pineapple spears with olive oil. Place spears on hot grill and grill until pineapple is browned and juicy, turning occasionally so all sides are grilled. Remove grill and set aside to cool to room temperature. 3. When the pineapple is cool, chop into small pieces. 4. In a large bowl, combine the avocado flesh, red onion, cilantro, jalapeño, and lime juice. Mash together with a fork until desired consistency is reached. Gently stir in the grilled pineapple. Season with salt and black pepper, to taste. Serve immediately with tortilla chips. How much lime juice? Sounds yummy! Sorry, I updated the recipe. I use the juice from 1 lime! I’m the grill man at my house, never have grilled anything but meat before! I guess it’s time. Like those grill marks on the pineapple, grill marks just make me feel so manly. Like manning the grill. Avocados not so much but i will be sure to include them. Wife says I need to eat more protein so she can cook less. Mmm! My favorite way to enjoy guacamole! I have a similar recipe posting on Monday…tis the season for ALL the guac! 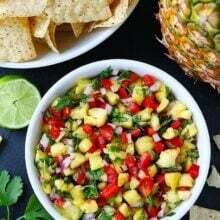 I love fruit in my guacamole (especially pomegranate) and the grilling of the pineapple sounds fantastic! Yes. Yes. Yes. Why haven’t I thought of this before. This would be an amazing combination! 😀 Brilliant. oh yum! you are so lucky- I ams till Very allergic to pineapple, and in fact, my last pregnancy may have brought it on! 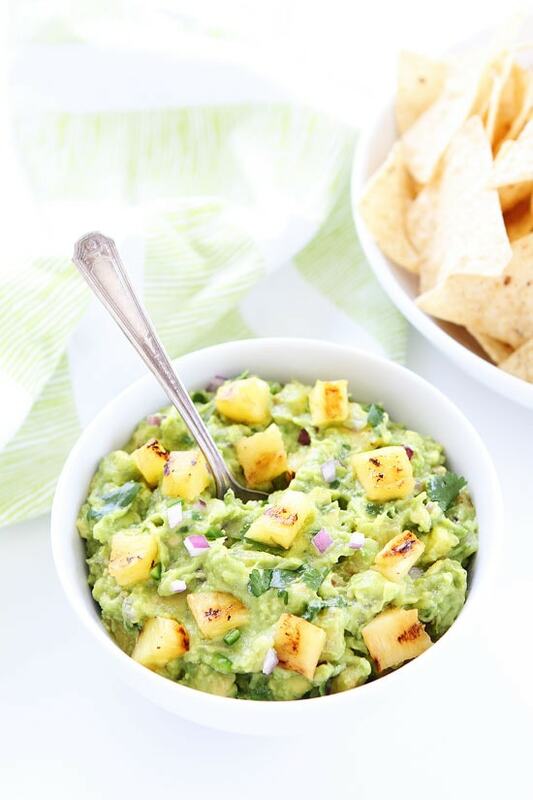 Pineapple guacamole sounds great, and with the jalapenos, it could be sweet and spicy. Mmmmmmm! Love the grilled pineapple twist! 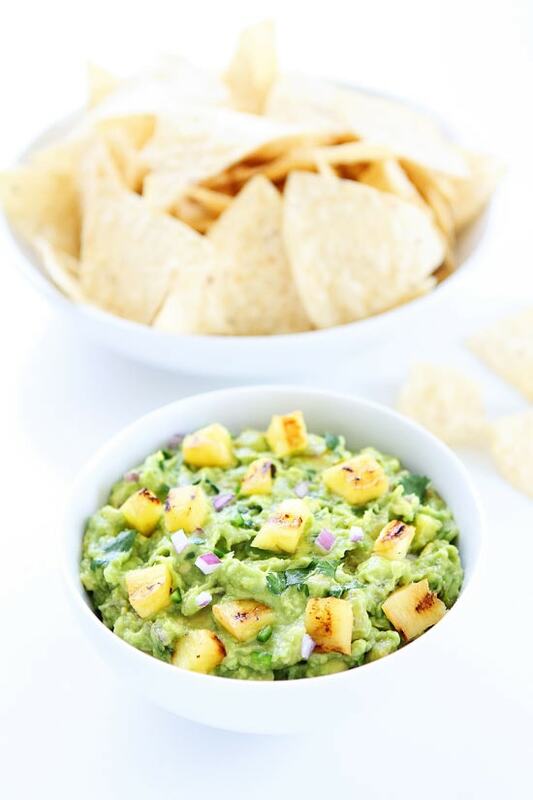 Love adding pineapple to guac! Oh my word! This looks so good!!! 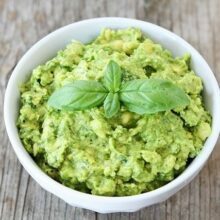 I’m a pretty devout plain guacamole fan, but for you I’d try this out! Plus, it doesn’t hurt that pineapple is one of my favorite fruits 😉 I love this spin on traditional guacamole! I don’t have a grill…can I broil the pineapple? My husband is a Grill Master and Pineapple Enthusiast. We are both trying to eat more avocado but aren’t the biggest fan of them, this sounds like an amazing way to make it tastier! Our family has been grilling fruit for a while now, Peaches and steak [yum].